Yuan Tseh Lee (Chinese: 李遠哲; pinyin: Lǐ Yuǎnzhé; Wade–Giles: Li³ Yüan³-che²; Pe̍h-ōe-jī: Lí Oán-tiat; born November 19, 1936) is a Taiwanese chemist. He was the first Taiwanese Nobel Prize laureate, who, along with the Hungarian-Canadian John C. Polanyi and American Dudley R. Herschbach won the Nobel Prize in Chemistry in 1986 "for their contributions to the dynamics of chemical elementary processes". Lee's particular physical chemistry work was related to the use of advanced chemical kinetics techniques to investigate and manipulate the behavior of chemical reactions using crossed molecular beams. From January 15, 1994 to October 19, 2006, Lee served as the President of the Academia Sinica of Taiwan. In 2011, he was elected head of the International Council for Science. Lee was born in Shinchiku City (modern-day Hsinchu) in northern Taiwan, which was then under Japanese rule, to Lee Tze-fan, an accomplished Shinchiku-born artist, and Ts'ai P'ei (蔡配; Cài Péi), an elementary school teacher from Goseikō Town (梧棲港街), Taichū Prefecture (Wuqi, Taichung). Lee's ancestors were Hokkiens from Quanzhou, Fujian, in the same village where the Ming Dynasty philosopher Li Zhi was born. Lee played on the baseball and ping-pong teams of Hsinchu Elementary School, and later studied at the Hsinchu Senior High School, where he played tennis and trombone. Due to his achievements in high school, he entered National Taiwan University without taking the entrance examination and earned a B.Sc. in 1959. He earned an M.S. at National Tsing Hua University in 1961 and Ph.D. at the University of California, Berkeley in 1965 under the supervision of Bruce H. Mahan. He was a member of the Chemistry International Board from 1977 to 1984. In February 1967, he started working with Dudley Herschbach at Harvard University on reactions between hydrogen atoms and diatomic alkali molecules and the construction of a universal crossed molecular beams apparatus. After the postdoctoral year with Herschbach he joined the University of Chicago faculty in 1968. In 1974, he returned to Berkeley as professor of chemistry and principal investigator at the Lawrence Berkeley National Laboratory, becoming a U.S. citizen the same year. Lee is a University Professor Emeritus of the University of California system. One of the major goals of chemistry is the study of material transformations where chemical kinetics plays an important role. Scientists during the 19th century stated macroscopic chemical processes consist of many elementary chemical reactions that are themselves simply a series of encounters between atomic or molecular species. In order to understand the time dependence of chemical reactions, chemical kineticists have traditionally focused on sorting out all of the elementary chemical reactions involved in a macroscopic chemical process and determining their respective rates. Swedish chemist Svante Arrhenius studied this phenomenon during the late 1880s, and stated the relations between reactive molecular encounters and rates of reactions (formulated in terms of activation energies). Other scientists at the time also stated a chemical reaction is fundamentally a mechanical event, involving the rearrangement of atoms and molecules during a collision. Although these initial theoretical studies were only qualitative, they heralded a new era in the field of chemical kinetics; allowing the prediction of the dynamical course of a chemical reaction. In the 1950s, 1960s and 1970s, with the development of many sophisticated experimental techniques, it became possible to study the dynamics of elementary chemical reactions in the laboratory. Such as the analysis of the threshold operating conditions of a chemical laser or the spectra obtained using various linear or non-linear laser spectroscopic techniques. Professor's Lee's research focused on the possibility to control the energies of the reagents, and to understand the dependence of chemical reactivity on molecular orientation, among other studies related to the nature of reaction intermediates, decay dynamics, and identifying complex reaction mechanisms. To do so, Professor Lee used a breakthrough laboratory technique at the time, called the "crossed molecular beams technique", where the information derived from the measurements of angular and velocity distributions allowed him and his team to understand the dynamics of elementary chemical reactions. During his tenure, Lee has worked to create new research institutes, advance scientific research within Taiwan, and to recruit and cultivate top scholars for the Academic Sinica. In 2010, Lee said that global warming would be much more serious than scientists previously thought, and that Taiwanese people needed to cut their per-capita carbon emissions from the current 12 tons per year to just three. This would take more than a few slogans, turning off the lights for one hour, or cutting meat consumption, noting: "We will have to learn to live the simple lives of our ancestors." Without such efforts, he said, "Taiwanese will be unable to survive long into the future". He has been involved with the Malta Conferences, an initiative designed to bring together Middle Eastern scientists. As part of the initiative, he offered six fellowships to work on the synchrotron in Taiwan. Lee married Bernice Wu Chin-li (吳錦麗 Wú Jǐnlì), whom he has known since elementary school. They have three children: Ted, Sidney, and Charlotte. In 2003, he was one of 22 Nobel Laureates who signed the Humanist Manifesto. Lee played an important role during the 2000 Presidential Election and since then has been a supporter of the Pan-green coalition which advocates Taiwan independence. In the last week of the election he announced his support for the candidacy of Chen Shui-bian who subsequently won a narrow victory over James Soong. Chen intended to nominate Lee to become Premier, but Lee declined after a few days of deliberation. Lee has been the President of the Academia Sinica since 1994 and renounced his U.S. citizenship to take the post. At the request of President Chen, Lee was the Republic of China's representative in the 2002 APEC leaders' summit in Mexico. (Presidents of the Republic of China have been barred from joining the APEC summits because of objections from the People's Republic of China.) Lee represented President Chen again in the 2003 and 2004 APEC summits in Thailand and Chile, respectively. In January 2004, he and industrial tycoon Wang Yung-ching and theatre director Lin Hwai-min issued a joint statement asking both Chen Shui-bian and Lien Chan to "drop hatred and extreme behavior and resort to honesty." This, and other critical statements of the President, led to speculation that he would not back Chen again in the 2004 elections until he issued a statement of support for the DPP on March 17, 3 days before polls opened. He was elected President of the International Council for Science in 2008, to start his term in 2011. Lee was one of the four Nobelists who established the Wu Chien-Shiung Foundation. 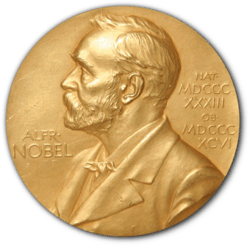 In addition to the Nobel Prize, his awards and distinctions include Sloan Fellow (1969); Fellow of American Academy of Arts and Sciences (1975); Fellow Am. Phys. Soc. (1976); Guggenheim Fellow (1977); Member National Academy of Sciences (1979); Member International Academy of Science, Member Academia Sinica (1980); E.O. Lawrence Award (1981); Miller Professor, Berkeley (1981); Fairchild Distinguished Scholar (1983); Harrison Howe Award (1983); Peter Debye Award (1986); National Medal of Science (1986). 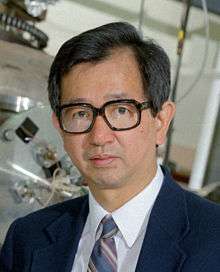 Yuan Tseh Lee was awarded the Othmer Gold Medal in 2008 in recognition of his outstanding contributions to progress in chemistry and science. His post-doctoral supervisor and fellow Nobel Laureate Dudley Herschbach called Lee "The Mozart of physical chemistry". ↑ "Yuan T. Lee and Molecular Beam Studies". Office of Scientific and Technical Information, United States Department of Energy. Retrieved 1 December 2016. ↑ "Yuan T. Lee Professor Emeritus". Berkeley College of Chemistry. Retrieved 1 December 2016. ↑ "Yuan T. Lee - Biographical". Nobel Prize.org. Retrieved 1 December 2016. ↑ "Yuan Lee, Taiwan". Global Ideas. September 7, 2010. ↑ Lerman, Zafra (February 10, 2015). "From Fighting for Human Rights to Building a Bridge to Peace". Science & Diplomacy. 4 (1). ↑ "Notable Signers". Humanism and Its Aspirations. American Humanist Association. Retrieved October 2, 2012. ↑ "诺贝尔奖得主卸任 "李远哲时代" 黯然落幕". News.cn. 24 October 2006. ↑ Ko, Shu-ling (November 14, 2004). "The struggle for an international voice". Taipei Times. Retrieved 1 December 2016. ↑ Abraham, Gerber. "NPP focuses on family in night rally". Taipei Times. Retrieved 9 January 2016. ↑ "Chemical Heritage Foundation to Present 2008 Othmer Gold Medal to Yuan Tseh Lee". College of Chemistry. University of California, Berkeley. 26 February 2008. Retrieved 12 June 2014. ↑ "Academician Yuan Tseh Lee Awarded 2008 Othmer Gold Medal by Chemical Heritage Foundation". Academica Sinica E-News. Academia Sinica, Taipei, Taiwan, Republic of China. 2008. Retrieved 12 June 2014. ↑ "Othmer Gold Medal". Chemical Heritage Foundation. Retrieved 1 December 2016. ↑ "'MAGNIFICENT TRIO' WHO SHED NEW LIGHT ON CHEMICAL REACTIONS". The New York Times. October 16, 1986. Retrieved 1 December 2016. Lee, Y. T. "Crossed Molecular Beam Studies and Dynamics of Decomposition of Chemically Activated Radicals", University of Chicago, United States Department of Energy (through predecessor agency the Atomic Energy Commission), (September 1973). Lee, Y. T. & S. J. Sibener. "Internal Energy Dependence of Molecular Condensation Coefficients Determined from Molecular Beam Surface Scattering Experiments", Lawrence Berkeley Laboratory, University of California, Berkeley, United States Department of Energy, (May 1978). Lee, Y. T., Sibener, S. J. & R. J. Buss. "Development of a Supersonic Atomic Oxygen Nozzle Beam Source for Crossed Beam Scattering Experiments", Lawrence Berkeley Laboratory, University of California, Berkeley, United States Department of Energy, (May 1978). Lee, Y. T., Baseman, R. J., Guozhong, H. & R. J. Buss. "Reaction Mechanism of Oxygen Atoms with Unsaturated Hydrocarbons by the Crossed-Molecular-Beams Method", Lawrence Berkeley Laboratory, University of California, Berkeley, United States Department of Energy-Office of Basic Energy Science, (April 1982). Lee, Y. T. "Molecular-beam Studies of Primary Photochemical Processes", Lawrence Berkeley Laboratory, University of California, Berkeley, United States Department of Energy, (December 1982). Lee, Y. T., Continetti, R. E. & B. A. Balko. "Molecular Beam Studies of Hot Atom Chemical Reactions: Reactive Scattering of Energetic Deuterium Atoms", Lawrence Berkeley Laboratory, United States Department of Energy, (February 1989). Lee, Y.T., "Energy, Environment, and the Responsibility of Scientists", (2007). Wikimedia Commons has media related to Yuan T. Lee.